Please feel free to contact us to book a retreat, reserve accommodation, inquire about game sports, ask about nature walks, to order organic vegetables, or for further information. (roads, satelitte etc) from different providers (OSM, Google etc). Ballin Temple is off the beaten track. It is nestled in the Slaney Valley and includes a special area of conservation, but it's easily accessible from Dublin (1 - 2 hours). 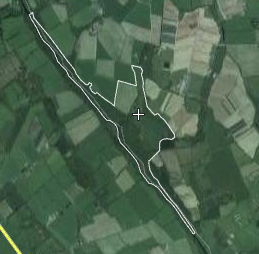 It is approached on the N80 and N81 and is almost direcltly between Tullow and Bunclody. Access is from the road between Ardattin and Clonegal at Monaughrim Cross which is close to Coillte's larget forest nursery (signposted). Please have a look at the map on the home page to get your bearings and find us. Thank you. Dublin International Airport is well connected. Flight time from London is less than 1 hour and from Paris just over 1 hour. On arrival, go through immigration (usually very quickly, especially if your originating airport is within the European Union) and on to baggage claim. Euros can be bought at the currency exchange office (bureau de change) in the baggage claim area. Once checked-in luggage is recoverred, proceed through customs (again, usually very quick) to the arrivals hall. Taxis are available from Carlow and Tullow.